Nothing in the settlement prevents EA from making college sports games, according to a lawyer on the case. About a week ago, EA finally reached a settlement in the long-running suit with collegiate athletes. Before the details were even publicly announced, EA declared that it was going to place its plans for a college football game on hold for now. However, according to a lawyer representing the players, it was never their intention to kill the entire franchise. "We would've been happy to have the game go forward. It was never our intent to not have this game [continue]," Leonard Aragon, a co-lead counsel for the players, told Polygon. "That's not us. We didn't tell them to do that... We would be fine if they published a game." According to the agreement, both EA and the Collegiate Licensing Company will pay around $40 million to college athletes for using their likeness. "There's nothing stopping [EA] from making the game, so long as they don't use players' names, images or likenesses. Or [they could] pay the students, which they didn't really agree to," Aragon said. However, EA seems pretty set in its decision, as its college football studio was recently absorbed into the Madden team, laying off several people in the process. 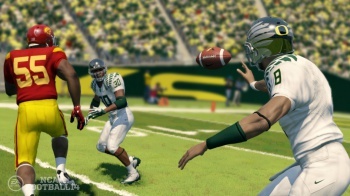 The long-running legal battle was a snarl of various antitrust and right-of-publicity suits filed by college athletes against Electronic Arts, the collegiate Licensing Company, and the NCAA. After last week's settlement, the NCAA remains the sole defendant in the case. "There's nothing stopping [EA] from making the game, so long as they don't use players' names, images or likenesses." ...If they do that, what in the bloody blazes is the point of using the NCAA name? Seriously, lawyers, you are really stretching there. "Or [they could] pay the students, which they didn't really agree to," ...Any reason you cut off the quote before the most important statement of the actual quote? You know, the actual point of the case was able using players' identity without actually paying them or giving some form of compensation? Yeah, I'm definitely sure they didn't intend to kill their parasitical little gravy train here. I understand that. I was more pointing out that their first suggestion wasn't even worth mentioning. So, let me try to get this straight. EA has a very profitable game series (or an idea for a potentially profitable game series) using the likenesses and names of college athletes, without paying them anything for using such things. The lawyers for the players sue, and say "If you're going to use our clients' likenesses, we'd like you to pay them." EA decides that this stipulation either makes such games unprofitable, or reduces their profits to the point where it is not worth making. This surprises the lawyers, as they never anticipated that having a company pay for something they previously were able to get for free would cause the company to not want to use something that they now have to pay for. I'm not what I should be more dumbfounded over. How were they to know EA was so abhorred by the thought of paying money for use of someone's likeness? So if EA can't exploit a game to rediculous portions they can it. Goes to show any one of their franchises could be on the chopping block if no longer exploitable. "No, no! We didn't intend for EA to make a decision such that they wouldn't pay us money. That's not what we wanted." Is what I am hearing. To be fair to EA here, this lawsuit is part of a bigger battle going on between college athletes (past and present) and the NCAA over player pay (short version: there isn't any). College sports are huge revenue drivers for (some) universities and sanctioning bodies like the NCAA. College games are televised nationally, video games are made, and merchandise is sold on the tie-in to the players playing the game. But, since college sports are supposed to remain "amateur" the players don't get a penny. Yes, EA was exploiting the players' likenesses without fair compensation. But! They were doing everything that the NCAA (which, I believe, is the body that actually has the rights to the players likenesses, numbers, souls, etc) required them to do (for instance, pay the NCAA a huge pile of money). The NCAA games likely don't sell as well the pro-level games, but the licensing fees EA must pay to the NCAA are probably pretty similar to the fees paid to the NFL. Additionally fees must be paid to license the logos and liveries of all the teams, the designs of the stadiums, and pretty much anything that has a real world analog. All that adds up fast, and to recoup that investment, EA would want a pretty sure chance of making a huge pile of money on the game. Unfortunately, an NCAA game is anything but a sure thing in the short term. The uncertainty of 1) getting sued again, 2) having to pay the players some unspecified amount of money, 3) spending a bunch of time on an NCAA game while negotiating with the players only to have some unforeseen development in the (still ongoing) lawsuit between the players and the NCAA tank the deal at the last minute and thus wasting a huge investment of time and money were all pretty good reasons to indefinitely cancel the NCAA line of games. Even keeping the NCAA team together and waiting for the dust to settle would be prohibitively expensive -- there's no indication that the lawsuit will end any time soon, and what do you put those devs to work on in the meantime that will actually pay the bills? What happens if the end result of the lawsuit is the death knell of the NCAA as we know it (as unlikely as that is)? If there's one thing businesses hate, it's risk that brings with it no promise of reward. TLDR: This is EA washing their hands of a convoluted business deal. This is not EA being genuinely moustache-twirlingly evil. So who was against the game on the college side? The organisation(s) that run the sport or the actual players? If the players already do it for nothing as amatuer athletes wouldn't they be happy with a free or discounted copy of the game or something? I have no idea how US college sports work, we have nothing like it all here so I have no experience of it. Well yeah but, American sport, American players, and most importantly, American lawyers. Who should really know how American companies are going to react to what they were aiming to do. It might have been better to allow them to publish the game and THEN sue them. The first part is the only important part! If EA wants to use the NCAA logo and their player's likeness then they need to pay up. This is just EA being cheap and after not getting their way they are taking their ball and going home. This kind of stuff is why I hate EA. I understand that. Mind you, I am NOT on EA's side. I'm just confused by the lawyer even mentioning that EA could use the NCAA name without using any of the players. I'm not saying the lawsuit was wrong. I'm not saying that EA should be allowed to use the likenesses for free. But to say "Well, you can use the NCAA name, just not any of the players or data that goes with it" seems to almost be legal gloating. In short, I disagree not with the lawsuit, or the lawyers saying that if they want to use the NCAA players, they need to pay for the right to do so. Rather, I'm a bit bothered by them pointing out a loophole that they know EA wouldn't take as a means of showing that they are not screwing over EA. I thought these titles had"RB 06" with visuals, and abilities very similar to the eqivilent player on the same team. If thats the case then the college kids are being primadonnas. They are being paid to play, its called a scholarship. No one forces them to play football. They could apply for college without the scholarship if its so exploitative. The organisation that runs the court was a co-defendant it appears (and the only defendant who hasnt so far settled), it appears to be the players. And the statement we don't have anything like it over here is not quite as clear cut as you might think. It's not quite as front and center especially media wise but a number of our pro sports have teams with a large student contingent (Leeds Rhinos Rugby League team commonly has a strong university contingent). The Boat race is also a sign that occasionally in theis country University sport is taken as something to be broadcast nationally. They cut off the quote because who in their right mind would pay $40m for the licence? I doubt the game would be worth it for that kind of investment on licensing alone for something that's really only going to sell in the USA. Well I know Colleges and Universities have sports teams and amatuer university/college athletes do compete at a professional level but we have nothing anywhere close to US college sports, they have attendance stats and viewer ratings that make professional big money sport teams green with envy. As for the boat race thats pretentious twaddle, I am not dismissive of the athletes themselves or the traditions and history of the race at all I just find most of the people watching it hilarious. Its for middle class people that have never been boating, or watched boating or been to either of those universities and will not watch any other boating or pay attention to those universities in any other way until the next year. Then they all sit and seriously discuss the boat race whilst trying to not get caught reading wikipedia about who won the race in the same sort of weather in 1987 so they can really give the impression about how sophisticated they are from watching the boat race every year, they mostly do it because they feel they have to because everyone else seems to be really into it. If they kept the teams, and all the other trappings of NCAA football, but randomized the players, I bet there'd still be a big market for the game. And that way they wouldn't owe anyone except the NCAA itself. Granted, it would get in the way of EA's "change the rosters and call it a new version" gravy train. But they could still put out a new one every year if they were actually improving the game in the meantime. It's not that simple at all. If the lawyers and students are demanding $40 million or something ridiculous for their image then there's no way EA can make that game. EA have always been happy to pay licensing fees to atheletes providing it's not so much that there's no way they can make a profit. Without knowing how much money they're demanding, you cannot just blame EA for this. And in fact, EA are almost certainly not to blame. Do you think if the demands were reasonable enough that EA could make money off it they'd turn around and say 'nah we'd prefer not to make money at all just so we can be dicks to students'? EA pays a lot of money for use of people's likeness for all their other sports games (of which there are a lot). esentially, College level sports get the same television viewing, merchandise, and until now videogames that professional sports got. the difference is that College sports is not considered a professional sport, thus they are not entitled for pay as would a professional football player. The main reasoning in the case was the NCAA and EA were profiting from players that were playing for free, namely all of them. A discounted copy of the game sounds good until you realize how many millions passed between EA and NCAA. If I could use a bit of hyperbole, it's like pirating music from an artist. I think the problem was already that the NCAA makes lots of money exploiting the students through this manner. EA got caught in the cross-fire as students were upset that their likenesses and names were being used well after their departure from the NCAA to promote stuff, even 40 years later. Now think about what that feels like and what it must feel like knowing another company can hop on board and also use you to make money without giving you anything. That is what this ended up being. And yet, confronted to here, they opt instead to pull the game. Indeed, so that couldn't have been the issue. The lawyers are just upset about not being able to leach any more money off this. Actually, this sounds a lot like what the western consumer culture is doing to itself. "We didn't mean to ahnialate this planet's ecosystem until it ceased to support our civilization any further, we just wanted to be able to consume any and every recourse we could possibly get our hands on with no concern for the long-term consequences"
Or, on a more personal level, "I didn't mean to get your dumped by your fiance, I just wanted to out you for cheating on your boyfriend with a boy in exchange for a promise that he'll move across the country to be in your life again only to then expel him from your life because he's not your boyfriend"
...I'm pretty sure using the teams would fall under the "no likenesses" part. Sure, they could use only the trappings, as you put it, of NCAA football, but at that point, when you don't have the players or the teams, why bother even using the name? The NCAA (and by extension, the schools), has its own deal with EA. The issue here is with the players represented. Even though they aren't named, EA matched many other stats (height, weight, jersey number, etc) with the actual players at those positions. For example, the current Notre Dame quarterback is Tommy Rees (6'3", 215lb, #11). If they released the next NCAA game with an unnamed quaterback who was 6'1", 195 lb, and number 7, Rees probably wouldn't have grounds for a lawsuit. At least not based on this ruling. 40 million is quite a big hit there. That's probably a million sales worth. Oh, OK. Sorry, I didn't realize it was just the players that was at issue. And really, EA was doing that? What the hell? Did they think they could get away with that? Perhaps EA will be more careful in the future about exploiting people who have the money to sue them. Then again this is EA we're talking about here. I'm surprised they didn't try to use the EULA no contest law system on them as I'm sure some of the players own EA games. You are waay out in left field on this one. The NCAA has done lots of licensing deals in other areas with other goods, the 40 million figure is a starting off point, then they get together and negotiate something lower. EA thought they could have it for nothing, were not able to get away with it, and now are scrapping the whole thing to strengthen their bargaining position later, if they do decide it is worth it to them to pursue a deal. The way these deals work is that both parties try and start from a position of strength and work out a deal that hopefully represents the value of both sides. NCAA certainly would love to see the money from an EA sports game. I personally would like to see another contender come in and scoop that lic. like EA has with the NFL. Sounds like someone killed the golden goose. Yeah, 40 million dollars. That's an insane amount of money. They would have to sell 800,000 EXTRA copies of the game at full price just to make up for that kind of cash; on a game that has only sold 1,140,000 copies total. Like they are supposed to magically just increase their sales by 70% in order to retain profitability? For that much money they could add a full 400 extra employees(programmers, writers, gameplay designers, artists) to any project they wanted. That's the salaries of the entire Dragon Age: Inquisition team for an entire year if not longer. So both companies are negotiating to achieve a price they would like and you hate EA because EA are sacrificing a games worth of profits to achieve a better negotiating position?